Rarely has the world seen such splendour and opulence as in the ages of the Byzantine Empire. Gorgeous palaces, churches decorated with splendid mosaics and strong fortresses bear witness to a medieval civilization, able to thrill visitors and scholars. Thessaloniki, the second capital of the empire after Constantinople, has inspired excellent pieces of art all around the region of Northern Greece. Our tour will be a journey in time which will reveal an unknown world of deep spirituality, political intrigue and outstanding art. Entrance fee for two of the monasteries of the Meteora. Boat transfer in lake Pamvotis, in Ioannina. Although the Eastern Roman Empire, known as the Byzantine Empire, lasted for more than a thousand years, it remains largely unknown: yet, the Eastern Middle Ages have been a time of development of philosophy, law, theology, art and architecture. All these interesting aspects reflect largely on the Greek territories due on one hand to the proximity to Constantinople, the capital of the Empire, and on the other to the Greek basis of its culture. Thessaloniki has been the second capital of the empire and received rich financings by the imperial court: the city’s churches are nowadays recognized as heritage of mankind by the UNESCO for its outstanding historical and artistic importance! 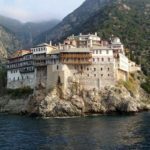 Mount Athos remains since the byzantine era an independent monastic state that conserves the architecture of the time, while cities like Veria and Kastoria are dotted with impressive churches decorated with some of the most beautiful frescoes. After the fall of Constantinople to the crusaders a new state flourished in the region of Epirus, that left its traces in Ioannina and Arta, while the Meteora remain one of the highlights of Greece both for the unique landscape and for the uniqueness of the monasteries built on top of the rocky pillars! 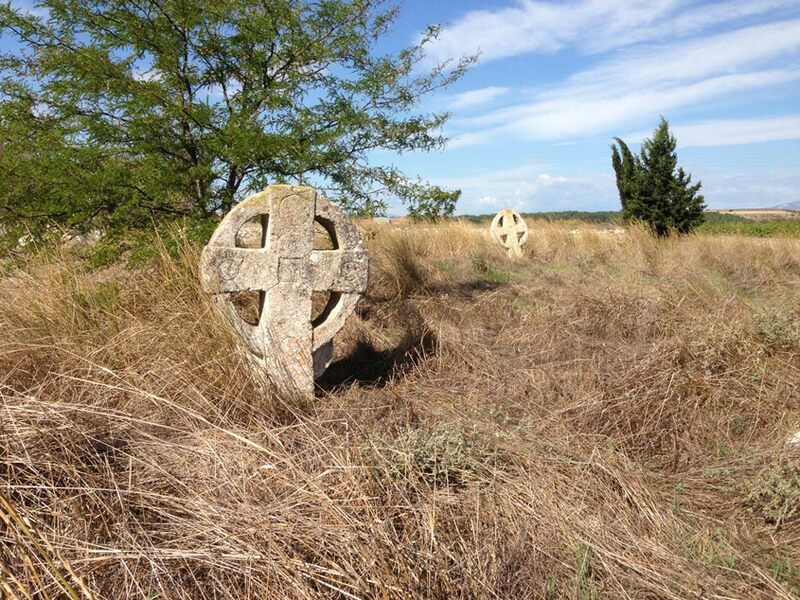 The ‘Byzantine Splendour’ is a historical tour, that mostly visits cities, churches and museums, yet it may involve some walking on rocky archaeological sites, under the sun. The byzantine museum, Caesar Galerius’ palace and the byzantine churches of Thessaloniki. 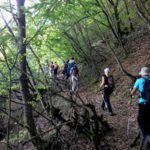 The cruise in lake Prespa and the visit to the hermitages. The castle of Ioannina and the island in lake Pamvotis. The monasteries and the landscape of the Meteora. Hosios Loukas monastery in Steiri and Dafni monastery in Athens, both UNESCO monuments. 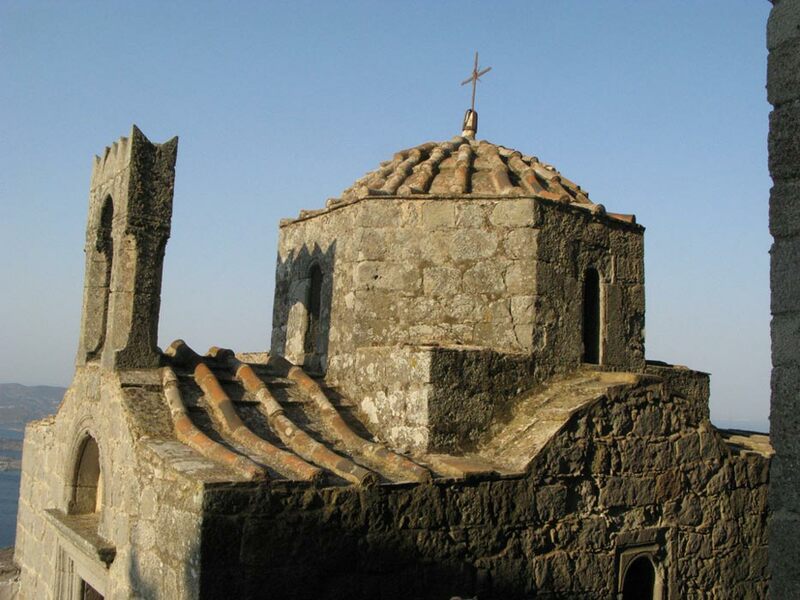 The ghost-city of Mistras in the Peloponnese with the imperial palaces and chapels. Thessaloniki (Salonica) is the capital of the modern region of Macedonian, founded in 315 BC by King Kassander of Macedonia, brother-in-law of Alexander the Great. The city has known such glory in the Roman period, being under the tetrarchy of Diocletian, one of the four capitals of the Roman empire. Here, an important political, military and cultural center was formed that turned Thessaloniki into the second capital of the Byzantine Empire as well. 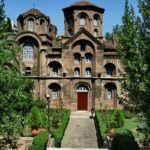 We are visiting the Museum of Byzantine History of the city, the Rotunda, the Triumphal Arch and the palace of Caesar Galerius, the churches of Agia Sofia, Acheiropoiitos and Agios Demetrios, the patron Saint of the city and the Roman Forum. Accommodation in the hotel, dinner and overnight stay in Thessaloniki. From Thessaloniki, following the Egnatian Way, modern highway running parallel to the ancient Roman road, we reach Veria. Important city since the times of the Macedonian kings, Veria became an important commercial crossroads, that has been one of the stops of St. Paul during his second missionary journey. There still exists the podium where the Apostle is said to have spoken to the local people. We also visit the Church of the Resurrection with beautiful frescoes by Georgios Kalliergis and the old Cathedral of the city recently restored. Another prominent center of Byzantine art and architecture is Kastoria, on the banks of the homonymous lake. Upon arrival, we visit the Koumbelidiki and Mavriotissa churches, built on the shoreline. Accommodation in the hotel, dinner and overnight stay in Kastoria. After breakfast, we leave Kastoria towards the Prespa lakes. Here, in locations that can only be reached by boat, in the caves of the rocks appear some hermitages, unusual for their place as for the decoration. We enjoy the boat cruise on the lake to reach these frescoed eagle-nests! 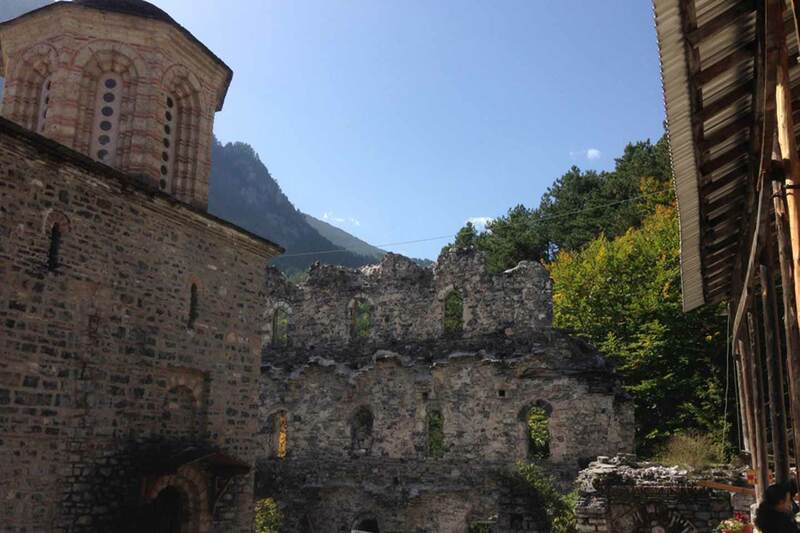 On the small island of Agios Achilios we visit the ruins of the homonymous church, the center of Bulgarian spirituality, while in Agios Germanos we visit the church of the 8th century, decorated with 18th century frescoes. After the visits around the lake, we take the road to the Meteora: in the heart of the region of Thessaly, rises a complex of monasteries nested upon rocks that resemble to columns. Their interior is decorated with breathtaking frescoes and mosaics. Upon arrival at Kalambaka we visit two monasteries of the Meteora, while we stop to admire the unique landscape. 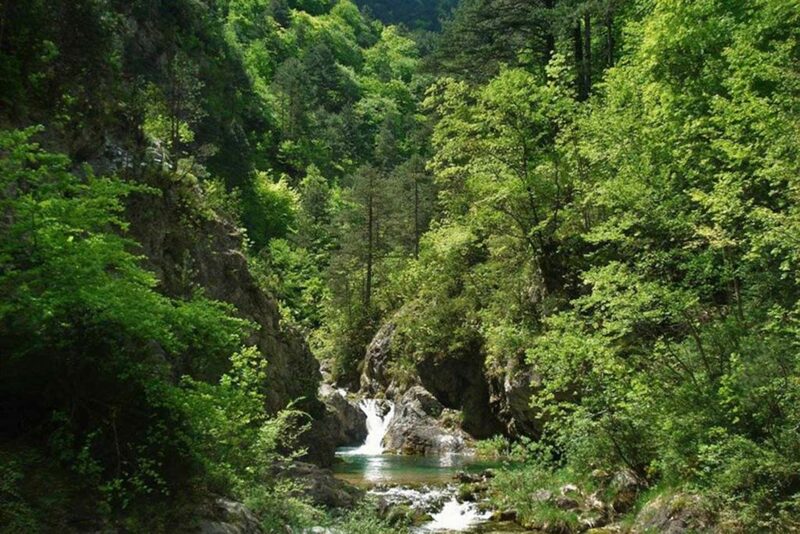 Accommodation in the hotel, dinner and overnight stay in Kalambaka. After the fall of Constantinople under the crusaders, the Despotate of Epirus was formed in the homonymous region, center of great political and spiritual power and of contacts with the West. Rich monasteries appeared in the region thanks to the financing of the emperors and the best artists offered their works to decorate them. 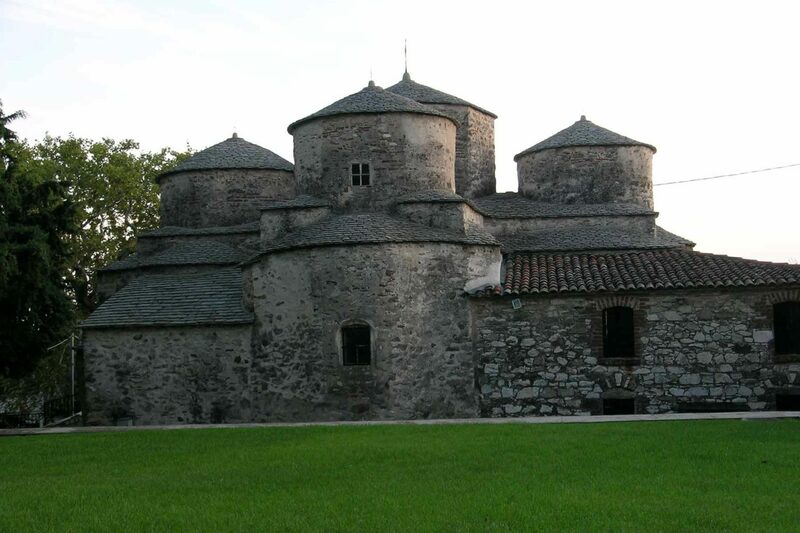 In Ioannina, we visit the Byzantine Museum and the Filanthropinon monastery, built on an island in the middle of the Pamvotis lake, where we will admire frescoes depicting the ancient philosophers together with the Christian saints! 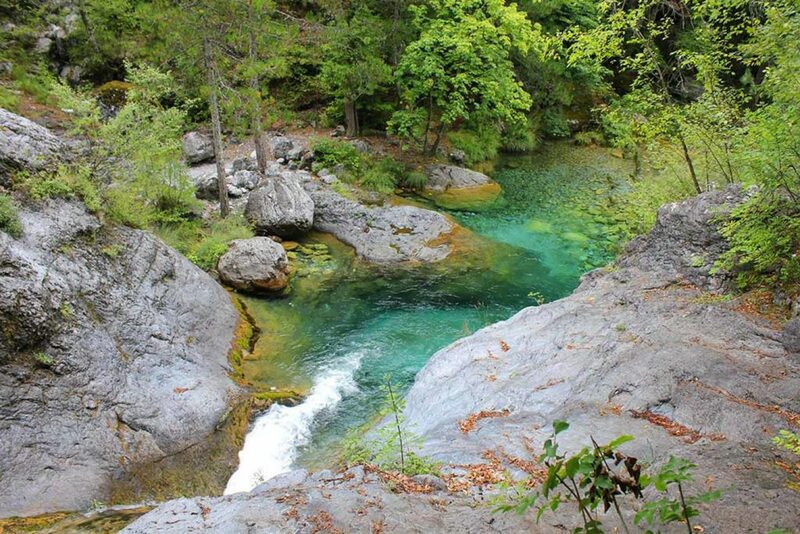 Accommodation in the hotel, dinner and overnight stay in Ioannina. After breakfast departure from Ioannina for Arta, the medieval capital of the Despotate of Epirus; in Arta, we are visiting the church of Parigoritisa, old imperial chapel and the bridge of Arta, famous by the many folktales. The road is tortuous and starts climbing the mountains of Aetolia before we arrive at Proussos monastery, built between the vertical rocks like an eagle-nest. 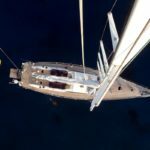 After the visit, accommodation in the hotel in Karpenissi or nearby, dinner and overnight stay. Today, after breakfast we leave Karpenissi to reach Delphi. Besides the famous oracle that we are visiting together with the archaeological museum, there is an absolute masterpiece of classic Byzantine art in the region: the monastery of Hosios Lukas. Since ancient times, Delphi has been a place of outstanding importance and sacredness: here was the center of worship of Apollo and his oracle which could tell the future. 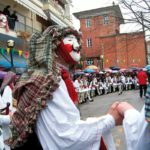 In Byzantine times, in a village not far from the ancient oracle Hosios Loukas Monastery was founded, which today is protected by the UNESCO for its historical and artistic importance. Accommodation in the hotel, dinner and overnight stay in Arachova. The capital of Greece, where we arrive today is best known for its classical ancient monuments, however there are byzantine monuments of enormous importance: our visit starts from Dafni monastery, just outside the city, that such as the Hosios Loukas, belongs to the monuments-heritage of mankind protected by the UNESCO, decorated with splendid mosaics. Our visit continues with the famous church of Kapnikarea in the historical center of the city and of course we will also dedicate some time to the splendid new Acropolis Museum and the picturesque Plaka. Accommodation in the hotel, dinner and overnight stay in Athens. 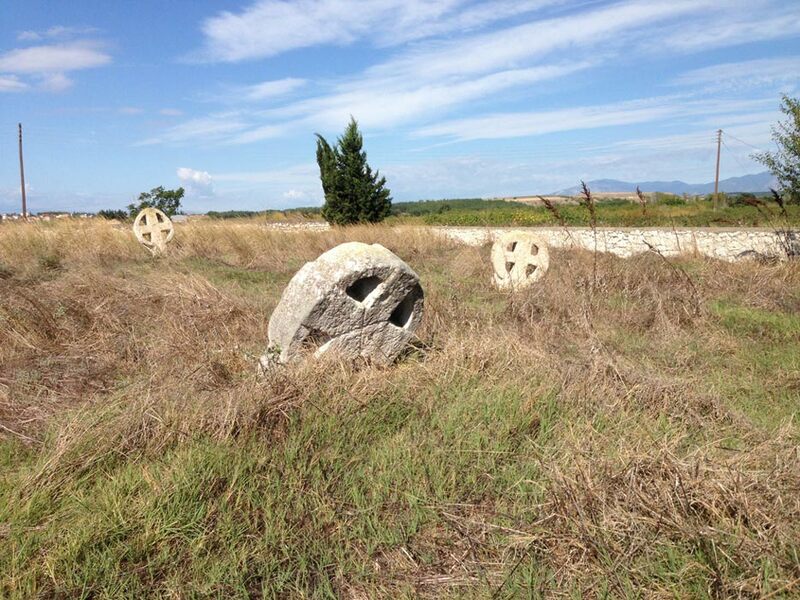 The site of Mistra, in southern Peloponnese, is a unique witness to everyday life of the Byzantine upper class: hence came the great imperial families of late empire. Here, there still stands the chapel of the Coronation of the last emperors. Starting from the citadel we will cross the archaeological site with the palaces of the imperial families, the mansions of the noble, the churches, the street, the arches, the fountains. Before returning to Athens we will stop briefly in the picturesque town of Nafplion, the first capital of the modern Greek state. Dinner and overnight stay in Athens. Day at leisure and transfer to Venizelos international airport of Athens for the flight of return. End of services.